Today I want to take a look at one of the best cards from Boundaries Crossed and what I believe to be the best overall card from the set – Landorus EX. Looking back at Regional Championships the major decks of the meta game were Hydreigon/Darkrai, Darkrai + Good Stuff variants, Rayquaza/Eelektrik, and Zekrom/Eelektrik, all decks that shared one major theme: reliance on Fighting weak Pokemon. This is a meta game that is very vulnerable to the havoc that a strong Fighting Pokemon, such as Landorus EX, can bring to the table. I actually got in a week of testing Landorus EX variants running the Etherdex engine before it was discovered that Ether had been cut from the set in favor of reprints of some old Item cards. What had become clear to me was that in this format, Landorus EX was completely broken. I am not sure if players would have been able to handle the regicide of the current king of the format (Darkrai EX) that would have occurred in such a format. Landorus EX is already good thanks to its early aggression, but pairing it with an engine that made a turn 2 150 damage attack a commonplace, as well as making that 150 attack easy to charge back up made it way too strong. Against counter decks, Landorus EX decks could rely on the Ether engine to power up a set of backup attackers very quickly to deal with these threats. I really think that Ether ended up getting cut from the set because TPCI didn’t want such a Landorus EX centered format. Even without the support of Ether, Landorus EX will still be a very strong card, and will make a major impact on the format, just in a more balanced fashion. 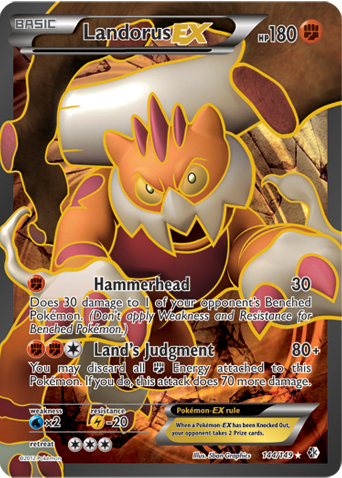 Taking a step back, let’s take a look at Landorus EX as a card. Landorus EX is a Basic Fighting type Pokemon with 180 HP, a weakness to Water, and a resistance to Lightning. Its first attack Hammer Head costs F and does 30 damage to your opponent’s active Pokemon and 30 more damage to one of your opponent’s benched Pokemon. Its second attack, Land’s Judgment does 80 damage, with the option to an additional 70 damage at the cost of discarding all Fighting Energy attached to Landorus EX. The first attack is going to be the main reason that Landorus EX will see a lot of play. 30 damage is a really strong turn one attack, and the ability to also place 30 damage on one of your opponent’s benched Pokemon is really strong for setting up later knockouts, especially against evolution decks. There have been lots of comparison between Stunfisk DRX and Landorus EX in the utility of their first attacks, as they are quite similar, but the 10 damage difference really does help set Landorus EX apart from Stunfisk. Let’s take a look at some common starting situations, and why Landorus EX is much stronger than Stunfisk. The most common use of Hammerhead and Muddy Water are as turn one Tynamo killing attacks. As both attacks can hit for weakness, they are both able to knock out a Tynamo on turn one. However, if there is an Eviolite attached to the Tynamo, Muddy Water will only do 20 damage, short of knocking out a Tynamo, while Hammerhead will do 40 damage, still enough to get the knockout. The strength of Hammerhead also comes more into play with the evolution of Eelektrik. Stunfisk, for example, say your opponent starts two Tynamo, and evolves one of them into Eelektrik on turn 2, and the other one gets knocked out. 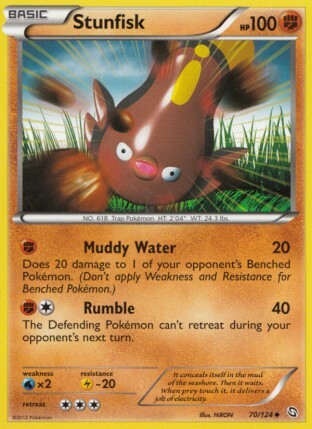 With Stunfisk, that Eelektrik will have 20 damage, and cannot be knocked out by another Muddy Water attack, and instead you would need to attach another Fighting Energy and use Rumble to get the knockout on Eelektrik. Against Landorus EX, however, the Eelektrik would have 30 damage on it, and could be knocked out by a Hammerhead. This is even more important when you take into account that you won’t always have that Pokemon Catcher in hand to take the knock out on the Eelektrik. With Stunfisk, it would take five turns of snipe to knockout a benched Eelektrik, while iwth Landorus EX, it would take just three turns of snipe, while doing more damage to whatever your opponent’s Active Pokemon might be. Against Hydreigon/Darkrai decks, Stunfisk is also a lot less effective. 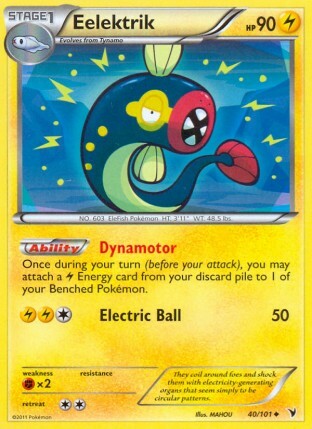 The Stunfisk player would need a PlusPower in hand to get the donk on a Dark Deino, and it would take three turns to knock out a Dragon type Deino, and with Computer Search in the format, that will likely be too late, and that Deino will have evolved to Hydreigon. Landorus EX however donks Dark Deino, while being able to knockout Dragon type Deino with two Hammerheads. Stunfisk is also a lot less efffective against Sableye, which is a common starter in Darkrai decks. Stunfisk at best can hope to knockout two Sableye by turn three with Muddy Water, assuming they hit a Plus Power on the first Sableye and a PlusPower on the second Sableye as well. Landorus EX is able to do this one turn sooner. Against a possible Sableye start, with one benched Deino, Landorus EX can Hammerhead a Sableye and Deino on turn one, and then if on either of those turns, if the Landorus EX player hits a PlusPower, they can take a double knockout on turn 2 with Hammerhead, something Stunfisk just can’t do. Against Darkrai EX, Hammerhead is a much stronger opening play. If the Landorus EX player can hit two Plus Powers over any combination of the first two turns, they can leave a Darkrai EX at 160 damage, in range for a snipe knockout on turn 3, all with a one energy attack, while also placing 60 damage elsewhere on their opponent’s field. In short, when comparing these two Pokemons’ snipe attacks, Landorus EX is like Stunfisk on steroids. The extra 10 damage means a world’s of difference in Landorus EX being able to put some pressure on your opponent’s field and being able to put a ton of pressure on your opponent’s field. Of course, Landorus EX comes with a second attack, which is also quite good. It doesn’t take a genius to figure out that 30 (from Landorus EX’s first attack) plus 150 damage (from Land’s Judgment) equals 180 damage…one of the magic numbers in the game. You won’t always be hitting Lands Judgement for an insane 150, but by using Exp. Share, Energy Switch, and some healing tricks, it’s easier to get this attack off than one would think upon first trying out Landorus EX. Just using Lands Judgment for 80 is really strong against Darkrai EX and other Fighting type EX’s. If you have previously sniped those Pokemon for 30, they will be in ohko range, otherwise a PlusPower will do the trick. This attack is most easily streamed when you play Landorus EX with some type of off Energy, such a Double Colorless or another Basic Energy type. Using another Basic Energy type is easily the strongest for trying to stream big attacks with Landorus EX, as it leaves an Energy on Landorus EX that can both be moved to another Pokemon with Energy Switch as well as conserved with Exp. Share, neither of which is true when using Double Colorless Energy, although I think DCE might be the right play just because of how well Landorus EX pairs with Mewtwo EX. Just something to keep in mind: Prism and Blend WLFM both count as Fighting Energy, so you would have to discard those if they are attached to Landorus EX and you want to swing for 150 with Land’s Judgment. While Landorus EX is a strong direct counter to all of the top meta decks from Fall Regionals, it’s not going to be the undisputed king of the upcoming format, as we are being given a new water archetype in Blastoise/Keldeo EX in Boundaries Crossed, which appears to be a direct counter to Landorus EX. Landorus EX is really bad in this matchup, as the Squirtle has an Ability that prevents snipe damage, and Keldeo EX easily ohko’s it with Secret Sword. While I wouldn’t rely on Landorus EX in this matchup, I should say that I have won some testing games against this matchup just by using Hammerhead/Land’s Judgment on the first few turns of the game while my opponent was unable to get out a Blastoise. While this might happens sometimes, it’s best not to try it as a strategy, as 9/10 times you will get burned bad. Instead, it’s best to rely on your backup attackers in this matchup. As far as backup attackers go, it might be tempting to pair Landorus EX with Grass type Pokemon to counter Blastoise/Keldeo decks, but there really aren’t that many good Grass attackers in the game. Shaymin EX might seem like an obvious counter, as it ohko’s Keldeo EX with ease, but the problem with Shaymin EX is that Keldeo EX easily ohko’s it back, making it a bad counter against the deck. 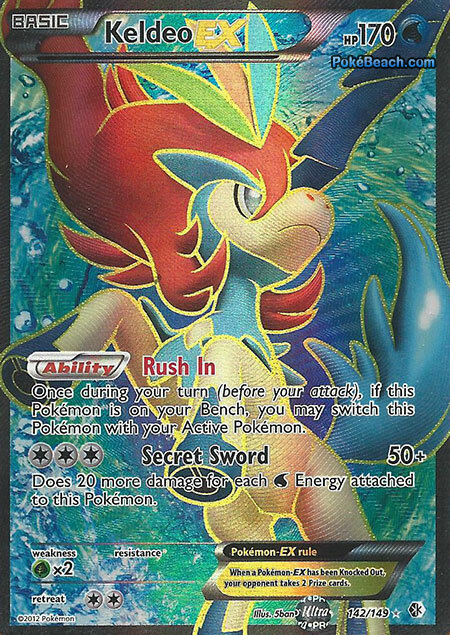 Virizion NVI could be used in an attempt to knockout the Squirtle’s on turn 2, and maybe a Keldeo on turn 3 with a PlusPower, but in general it is a slower attacker and is also easily ohko’d by Keldeo EX. I think the best grass attacker would probably be Virizion EPO in combination with Energy Switch to set it up in one turn, as it can ohko Keldeo EX with Sacred Sword, but that will be a difficult combo to pull off with too much frequency, and your Virizion is just going to get knocked out by a fresh Keldeo on the next turn anyhow. As far as grass attackers go, we will probably have to wait until they make a Virizion EX to have a true Grass counter to Keldeo EX. With Grass attackers as being determined bad partners for Landorus EX, where do you go? 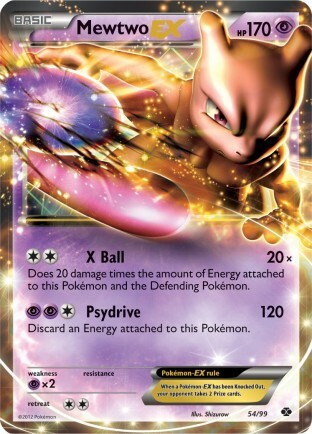 I think Mewtwo EX is probably the best alternative attacker for a Landorus EX deck to have. If a Keldeo EX is powered up and attacking for three Energy, Mewtwo EX can exchange 2hko’s with it. If they load up Keldeo EX’s with a ton of Energy to ohko Mewtwo EX, then you can easily knock it out with X-ball and a PlusPower. The key to getting ahead in this exchange is to play healing cards like Gold Potion, Super Scoop Up, and maybe regular Potion in an attempt to make your Mewtwo EX outlast their Keldeo EX’s to gain a lead in the prize exchange. Unfortunately most Blastoise/Keldeo decks are also playing healing cards, so this will often turn into a matchup of who better hits flips or draws into their healing cards. It’s not the prettiest way to get a win, but it works often enough to give Landorus EX decks a solid chance of beating any Blastoise/Keldeo deck. Regigigas EX could be another option for countering Keldeo, as it is probably the strongest Blastoise/Keldeo counter in the game, but I am uneasy playing the card in this deck as there is no Energy acceleration for Regigigas to power it up quickly as there is in a Ho-Oh based deck for example, and your strategy is around attacking on turn one with either Hammerhead or X-Ball usually, so having a four retreat cost Pokemon that can’t attack on turn one could hinder the overall strategy of the deck, but it will definitely be worth some testing with the deck. Perhaps fitting Landorus EX in a Ho-Oh based deck alongside Regigigas EX may be the way to go if you want to try this card combo. I think Darkrai EX could be another strong combo for the card, as you are able to put early pressure on your opponent with Landorus EX, while falling back on Darkrai EX later in the game (and using its Ability to free retreat Landorus EX), all while getting to take advantage of Sableye’s Junk Hunt for consistency. The card provides some Energy acceleration for Landorus EX with Dark Patch and Energy Switch, which will serve to speed up Landorus a little bit. I haven’t done any testing with this type of variant yet, but it is on my to do list, as it seems like it could be really strong. As far as Ace Spec’s go, I think Gold Potion is the best Ace Spec for Landorus EX decks. Computer Search is also good in these decks (as it is just good in any deck for consistency purposes), but being able to basically say your opponent didn’t attack on their last turn with Gold Potion is too strong to pass up in a Big Basics deck, which most Landorus EX based decks will be. The card could be paired with Recycle to be re-used multiple times throughout a game, giving Landorus EX some big tank potential. 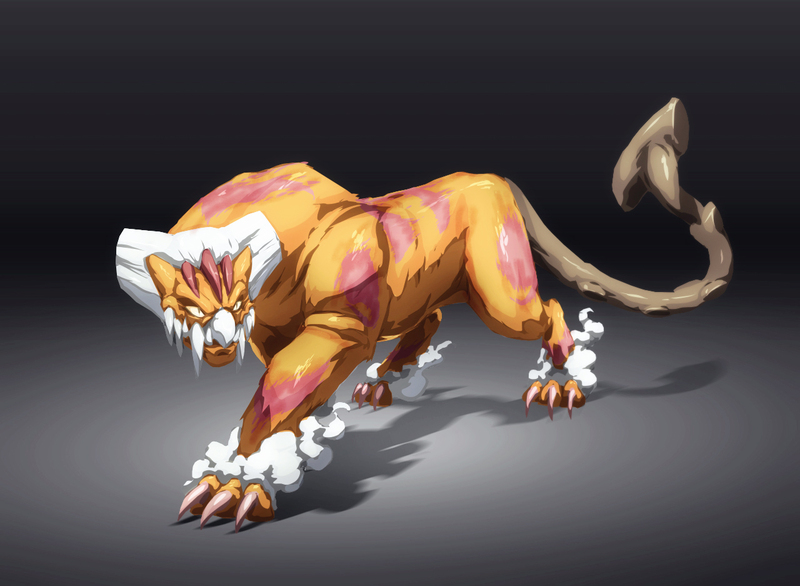 Therian form Landorus is quite scary indeed! I think Landorus EX is going to be a major force in the meta game during City Championships. Its first attack Hammerhead is one of the strongest turn one attacks in the game, and definitely the easiest to power up. Its second attack is also quite strong, and when given Landorus EX’s type counters most of the pre-existing meta game, it will surely be strong, especially if players don’t adjust to newer deck concepts at the start of City Championships. The Blastoise/Keldeo matchup isn’t all that great, but I know through some testing that a little Mewtwo magic can win Landorus EX decks the game in those matchups. I already have pre-ordered my Landorus EX’s from Troll and Toad, and will definitely have a playset to start City Championships, so I fully expect to use some type of Landorus EX based decks at some of the City Championships I play at. Landorus is worse than stunfisk,It is a bad EX. 2 prizes for 30 damage, Sure you want that? It is giving up 2 prizes at the cost of 30+30 to start the game, and it won’t just be for 1 turn. I think in most normal games it will survive for 3 turns before getting knocked out, with more than that not being all that infrequent. The strength of Landorus EX is the amount of early pressure that it puts on your opponent’s decks. Being able to knock out multiple pre-evolution / smaller support Pokemon is really strong, and even spreading for a few turns to get your opponent’s EX’s in ohko range for your backup attackers is very strong. Without Ether, Colress Machine, or some other type of Energy Acceleration engine, I don’t see Landorus EX working as much more than a really strong starter in the format it’s entering, but it really is one of the strongest openers in the game, which in itself makes it really strong. Now that Furious Fists is hitting soon, plus the US Nat win, we’ll be seeing a lot more of this guy.